Danny McKeever never met a stranger. He had the perfect personality for a bartender, a job he held for 20 years at the Summit Lodge coming on board back in 1993. An avid skier and golfer, the Killington region was a natural choice for McKeever to make his home. Originally from New Jersey, Danny McKeever moved to Bridgewater where he and his wife, Betsy, raised two boys. He truly married his best friend. When he was working evenings behind the bar, Betsy would stop in after her shift at work and have dinner in the Pub so they could spend time together. She was his rock and he adored her. Their boys, Kevin and Tim, were the light of their lives. The couple was also infamous for “gathering the strays” at the holidays. Anyone who was without family was invited to come to the McKeever home to share the holiday meal. Their home was a warm, welcoming retreat for those who would have otherwise been alone. Danny was a music connoisseur. If you were a contestant on “Who Wants to Be a Millionaire” with a musical question, Danny would be your “phone a friend.” He was a walking encyclopedia of music trivia. He could easily settle any argument over who sang a song or reciting correct lyrics, especially if it was an “oldie.” If Dan McKeever gave the answer, it was a done deal. Game over. Frank Chase, long time Killington entertainer, spent many a night crooning tunes in the Saints Pub with Danny behind the bar. “Dan was infamous for coming up with the closing lyrics when I was singing parodies,” Chase recalled. Frank also penned a parody about McKeever called “Take Your Clothes Off, Danny” sung to the tune of The Band’s “The Weight.” Danny would feign embarrassment when Chase had the entire bar singing it, but it was obvious he loved being the subject of one of Frank’s creations. Chase met McKeever in 1979. Having graduated pharmacology school, McKeever opened the Killington Pharmacy on the Access Road in a building that later became Mother Shapiro’s and today houses Sushi Yoshi. Chase said he stopped and asked McKeever to take his blood pressure. He then bought a bottle of red wine which McKeever assured him “would most likely remedy any blood pressure issues he might be having.” I spent a good deal of time with McKeever during the 6 years I lived at the Summit Lodge. During the busy winter seasons, I could just about set my watch to the sound of him scooping ice from the commercial ice maker into his bartender bucket. It was part of the set up routine to get ready to open the Saints Pub each night. It became a game with Danny and me – he would fi nish scooping ice and I would head down from the offi ce to the ice machine to pick up the strays he left on the fl oor. I think it got to a point where he purposely dropped a few cubes and left them, knowing I would be right behind him to pick them up and lovingly scold him later. Danny had a regular following of patrons in that bar, both locals and visitors. For as many inquiry calls the Summit Lodge would receive about room availability, we would get calls asking “Is Danny behind the bar tonight?” He charged the place with an atmosphere that made everyone feel at home. Always with a smile and a kind word for guests, though he could also dole out the sarcasm with the best of them. With a two-decade history at the Summit Lodge, Danny worked with literally hundreds of employees over the years. As word of his passing spread throughout Killington’s tight-knit hospitality community, the same sentiment resonated over and over – “He was one of my favorite people.” Ned Dyer worked most closely with Danny during that time. The two of them spent countless hours together at Summit Lodge where they forged a friendship that withstood the test of time. 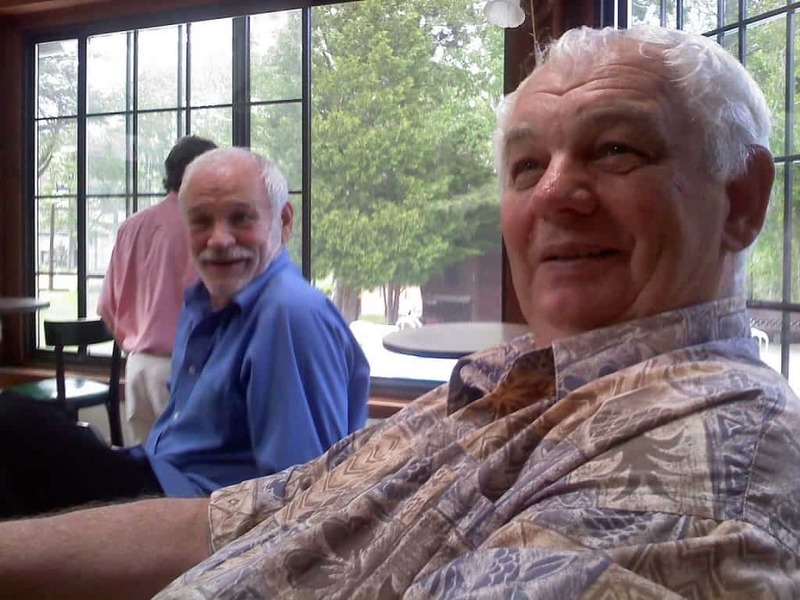 “Mere words aren’t enough to describe the loss of Danny McKeever,” Dyer said of his passing. “A more loyal friend could not be found.” McKeever was with his wife Betsy vacationing at the Jersey Shore when he succumbed to a heart attack while walking on the beach. As sad as his passing is to all who loved him, there is a sweet reprieve in the fact that he was doing something he enjoyed alongside his greatest love. Dan McKeever is survived by his wife, Betsy, two sons, Tim and Kevin, twin grandchildren, Mason and Chloe, and his loving sister, Jeanne. You can rest assured the next time Frank Chase plays and sings “Danny Boy” in the Saints Pub, has he done for years, there won’t be a dry eye in the house. I tried to find Danny when I was in Killington last year. It broke my heart to hear this sad news. It’s hard to imagine that I’ll never see him again. Killington people knew me as Linda Carnegie, and my sister in Denver even remembers playing golf with Danny and Betsy once when she was visiting. Such a sad loss.